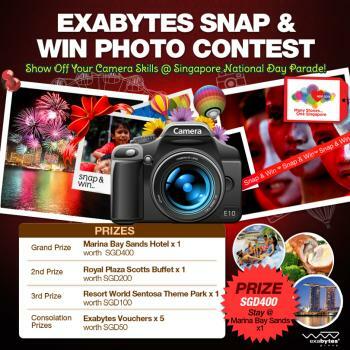 Copyright: You grant organizers the right to use the entry only in connection with the execution and promotion of the Singapore National Day Parade "Snap & Win" Photo Contest. Who can enter: Open to all Singaporeans only. Selection of winners is based on number of “VOTES” on Facebook. Winners will be selected within 2 weeks after the closing date and will be announced through email and in Exabytes Singapore Fan page. Online submission of digital photographs via Facebook. You need to place it on the bottom right corner of the photo.